The bells are rung for the main Sunday church services (except 8am communion!) and for various other special events (eg weddings). We practice on Tuesday nights from 7.30pm to 9pm. New recruits are always welcome. Other bands visit from time to time. The Tower Captain is Nick Beck who can be contacted on 01694 771894, or e-mail nick.beck@cardington.org.uk. The tower now houses eight bells after the augmentation of two new trebles cast by Taylors of Loughborough in 2005, thanks to a generous legacy from Kath Cooke, long term resident of Cardington and a ringer in the 1920s. In 1990 the original ring of four was increased to six by the addition of two new trebles also cast by Taylors, the money for this having been raised by the people of Cardington Parish. In 1981 the old ring of four were completely restored by Taylors, and installed in the clock room in an iron frame with new fittings. This new frame was installed beneath the old timber frame, which was retained in situ because of it's mediaeval origin. 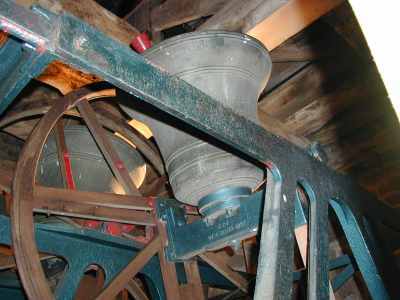 Entries from old records show that in 1553 there were three bells, in 1740 four, and in 1752 five. It then appears that in 1887 the old treble, and third (originally cast in 1740 and 1630 respectively), were recast to make a ring of four. There is no mention of a fifth bell and it appears that it had been removed sometime in the late 18th or early 19th century. 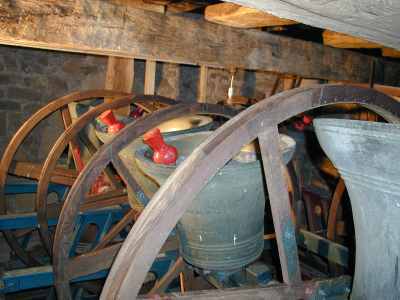 Originally the bells hung in line in the old timber "A" frame, and were rung from the vestry floor. In 1985 a new ringing gallery incorporating the organ platform was installed in the vestry space. The new pipe organ was installed in November the same year.